Does your plasticware seem to multiply in the night? Does it fall out of the cupboard every time you open the door? Do you get frustrated because you have trouble finding the right lid!? Here are a few of my tips on how you should be using your plasticware and how to keep spare plasticware in order. food in the the freezer and fridge. The containers should be multi purpose and should be used. If your plasticware is always sitting in your cupboard and if your cupboards are over flowing, then perhaps you have too much!? Once you have followed the key tips below on getting your plasticware in order, take note of the containers used frequently and keep these items close-at-hand in an easily accessible cupboard/drawer. For those items not being used at all, consider selling some on Ebay (especially Tupperware) or consider donating them to a local charity. A small number of spare containers is a lot easier to keep in order. Dividers are a great way to keep things from falling over and making a mess. Dividers can be used like a drawer that slides out so you can reach items towards the back of the cupboard. Don’t be tempted to use a Tuperware container as a divider as they are very expensive and should be used for its designed purpose. There are much cheaper dividing alternatives available. Finally, be diligent and maintain the system you have put in place by returning the containers to its permanent home after each use. NOTE: if you still have containers without lids or lids without containers after you have been through this process, keep them handy for a few weeks, but then discard them – most can be recycled – if you cannot find its mate. 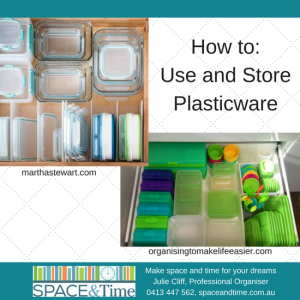 By following the above tips on how to use your plasticware and tips on how to sort, divide and store it. you will find you have more space and save time (and frustration) finding the corresponding lids. For further ideas on how to store your plastic ware, check out my Pinterest page here or if you need a hand to sort, divide and store your plasticware contact me to discuss how a few small changes to the system you use can make a big difference to how you use your stuff.